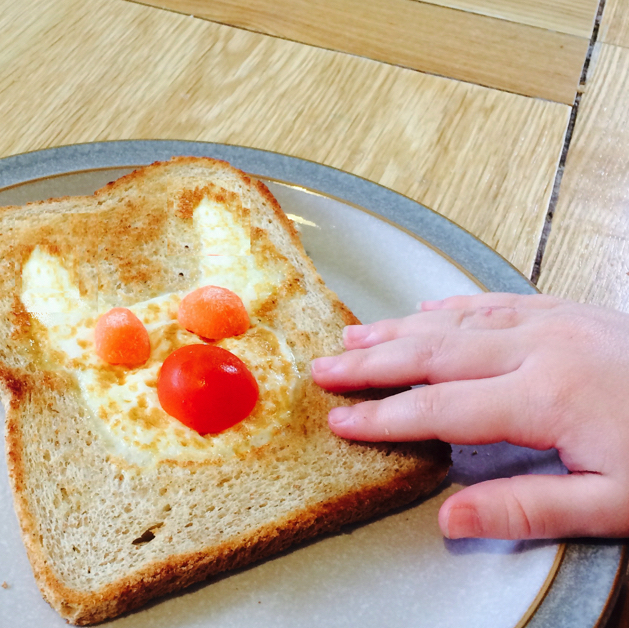 Make an Easter breakfast or lunch even more fun and get your kids practising their language and motor skills with this recipe activity and printable to make an Easter Rabbit in your toast. This recipe activity contains egg. 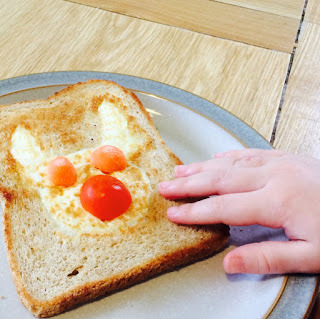 This is an idea we adapted from the Gruffalo recipe book, which is full of fun recipes that we've been happily creating for different occasions. Most cooking involves using my kids emerging motor skills and this kind of activity also involves some imagination which is great practice for kids with autism and other conditions too. There is also a free printable below. Use the cookie cutter to make a round hole on the lower part of your bread. This is a great motor skill, really helps to think about where the circle is going. It's also great for talking about different shapes. Lift out the bread circle, gobble it down it's not needed later. The hole has made the rabbits face so now tear our some sausage shapes to make ears. Grown-ups may need to help to tear out ear shapes in the bread. Butter what's left of the bread on both sides. This can be really challenging, as it means using both hands together (bilateral motor skills). Try to think about being gentle. If the bread tears, don't worry, grab another slice and start again. You can also just use a little olive oil in the pan instead later. Break the egg into a dish. Again this can be tricky as it uses both hands. Try tapping the egg on the side of the dish and then pushing the thumb into the crack. Grown-ups may like to have some kitchen towel or wipes for anyone who doesn't like sticky fingers. Now - decide what colour the rabbit is going to be? This is a great time to talk about colours and colour mixing generally. White with an orange nose - don't touch your egg yet! Next, a grown up can put a frying plan on a low heat. When it's warm, add the bread and once it's been in for about 20 seconds pour the egg mixture into the hole and fill out the space. If there is still a yoke in the bowl try to settle it in the middle of the Rabbit's face. Wait a few minutes and then a grown up can flip the bread and egg over with a spatula. Alternatively the bread and egg can be put onto a greased baking tray and cooked in the oven for about 6 minutes - do what works best for you. Once it's all cooked, add details to your rabbit as you'd like. Add a nose, maybe pink ham in the ears, cheese for whiskers, whatever you like. This part really helps kids think about what a rabbits face might look like. It involves thinking about a picture in their mind and this is a difficult skill for some kids so a great one to develop. If this may be too challenging, why not print out my free Rabbit toast face printable that can be used as a guide below. It's got space to write in which ingredients beside it so can be adapted and coloured in by either big or little hands. To get the printable, just fill in your email below, click submit, then click on the download. By supplying your email you will subscribe to our new blog posts, but you can unsubscribe at anytime. What will you be making for Easter? I genuinely enjoy to reading your posts. you have published article with perfectly! I definitely think this website needs a good deal extra attention. I’ll probably be once more to read lots more, thanks for percentage that info. i am happy to enroll in your network, found a whole lot of useful and useful information! Thats is such a good idea! I love it! What a fabulous idea! I might have to have a look for that recipe book once Isla is a little older. I can't wait to do bits of cooking and baking with her. awww looks lovely. what a great idea for breakfast or a light lunch! This looks lovely! Definitely something to try over Easter.